There is also the proposed Relief Line that would serve the development at East Harbour (the Unilever site) and connect with the King and Cherry streetcars at Sumach Street, as well as a planned GO station serving East Harbour. Demand east from Leslie to Woodbine is trivial, and this area would be served with, at most, improved bus service for the foreseeable future. The idea of a Bremner streetcar has been around for ages even though there really isn’t room for one on the streets where it would run, and nobody has explained how it would deal with the congestion accompanying any event at the Dome (aka Rogers Centre). The projected demand is nowhere near LRT territory, and some of the design options elsewhere would preclude construction of the line. Reconfiguration of GO and TTC facilities at Long Branch Loop to make a more convenient connection between streetcar, bus and train services. Whether a through service from Mississauga should operate into Toronto either as a western extension of the streetcar line or as a bus link, possibly through-routed north to Kipling Station and the Etobicoke City Centre at the Six Points. How much development and associated transit demand will occur at the Lakeview site, and where this demand will originate. It is fairly evident that a streetcar extension is not in the cards both because of likely demand levels and because the Toronto streetcar and Mississauga LRT networks are incompatible. The Six Points is also served by transit routes originating further north in Mississauga and by the GO Milton line. The Lake Shore corridor is not the only way riders from the west will reach this area. The study also considered ferry operations briefly. The fundamental problem for any ferry route is that the extra time required for access at both end of the trip must be offset by having a substantial demand close to the terminals. The service frequency must not impose an undue delay on trips that might be taken on other, frequent services. There has been no detailed review of sailing times or frequency, dock requirements, connecting services, foul weather operations or costs. This hobbles criticism of the mode, and gives an opening for politicians seeking a magic solution that will avoid taking road space or spending a lot to expand rail-based infrastructure. On the outer end of the route, the demand is low enough that streetcar service is all that is needed. Moreover, in places, there are road width constraints preventing dedication of exclusive lanes for transit. There is also the passenger boarding issue of providing safety islands at all stops to eliminate traffic conflicts and to speed loading. The ability to do this varies from one section to another. A challenge here will be to ensure that service is reliable (something the TTC does poorly), and that signal priority means what it says. On The Queensway, the combination of “signal priority” and farside stops has actually slowed operations. For the narrower parts of Lake Shore, one option proposed is the “Roncesvalles design” with curb lane bump outs at stops. Lake Shore is an arterial road, and with considerably less transit service, especially at off peak, than on Roncesvalles, a more local street where the through traffic demand is lower. This is not a viable option for Lake Shore. East of Legion Road, the line would operate in reserved lanes to Humber Loop although the configuration would be different for eastbound and westbound traffic. The reserved lane eastbound would begin at Park Lawn. The reserved lane westbound would end at Legion Road. This is possible because as part of redevelopment, land can be acquired on the north side of Lake Shore to widen the road and make room for the transit lane. With the redevelopment of the Christie’s site, a new loop is proposed to replace Humber Loop’s function. This would extend the 501 Queen cars out to the condo strip on Lake Shore, and would possibly be a western terminus for part of the service on the new waterfront link to the core bypassing Queen and King. This area has been the subject of a previous study, the Western Waterfront Plan, that proposed a reconfiguration of Lake Shore Boulevard to reclaim part of the existing median space for a transit right-of-way and to shift the eastbound lanes to the north freeing up parkland to the south. Three alignment options for this section survived from Phase 1 into Phase 2. Option 2D remains on Lake Shore rather than jogging north to The Queensway at Humber Loop. This option was rejected because it involves a difficult crossing at the Humber River. Option 2E is the recommended one. It uses The Queensway between Humber Loop and Colborne Lodge Road (the main road through the centre of High Park), and then dodges south to Lake Shore. One of the options dropped in Phase 1 was to link the new waterfront route to Exhibition Place via The Queensway, King and Dufferin. This would take a supposedly faster route to the core through an area of severe congestion compared with a protected right-of-way. 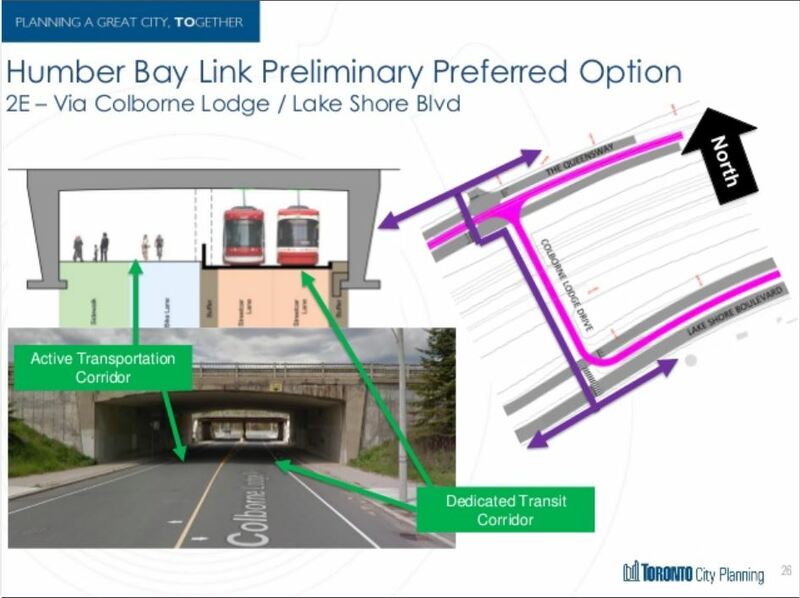 Colborne Lodge Road would be closed to traffic and reconfigured with transit in the east span of the underpass, and a combined pedestrian/cycling area in the west span. To provide sufficient clearance, the road level for the transit span would be lowered slightly. This arrangement places the transit junction at a comparatively quiet location and uses a link that does not now have much road demand. True transit priority for the turning moves across eastbound traffic at The Queensway and westbound traffic at Lake Shore will be essential to avoiding a bottleneck here. East from Colborne Lodge Road, the streetcar would run in the median of a revised Lake Shore Boulevard where the new road layout would narrow the width of intersections, an important consideration anywhere there will be significant pedestrian traffic. Missing from the presentation (although it was included in the display boards) is the detail of the route from Sunnyside through South Parkdale to Dufferin including possible stop locations and new/altered bridges linking South Parkdale to the waterfront. 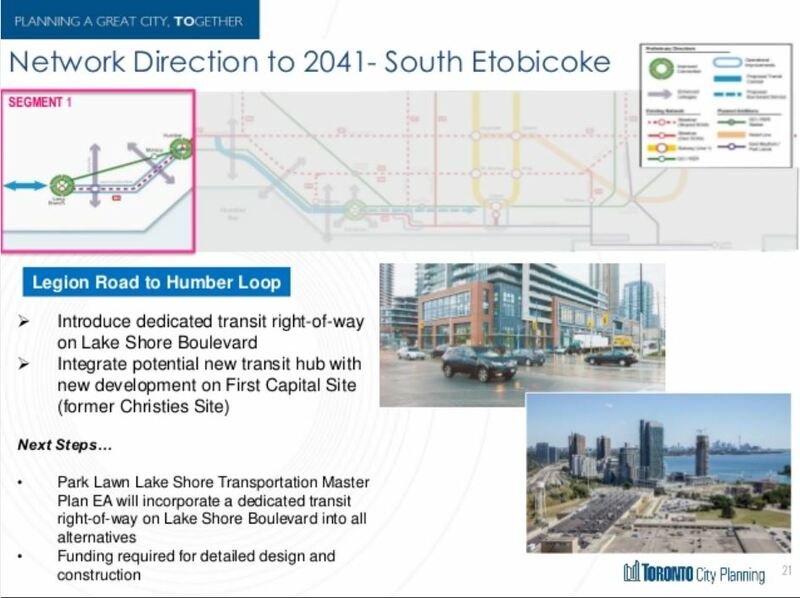 This is a major omission in the slide deck, and it erroneously gives the impression that the route would run express from Colborne Lodge to at least Dufferin. That is not the intent. The illustration below is taken from the display panels online, and its poor resolution is a due to the quality of material the City posted. This section of the route would link existing track at Dufferin Loop (the CNE Western Entrance Loop) to the main Exhibition Loop adjacent to the GO station. 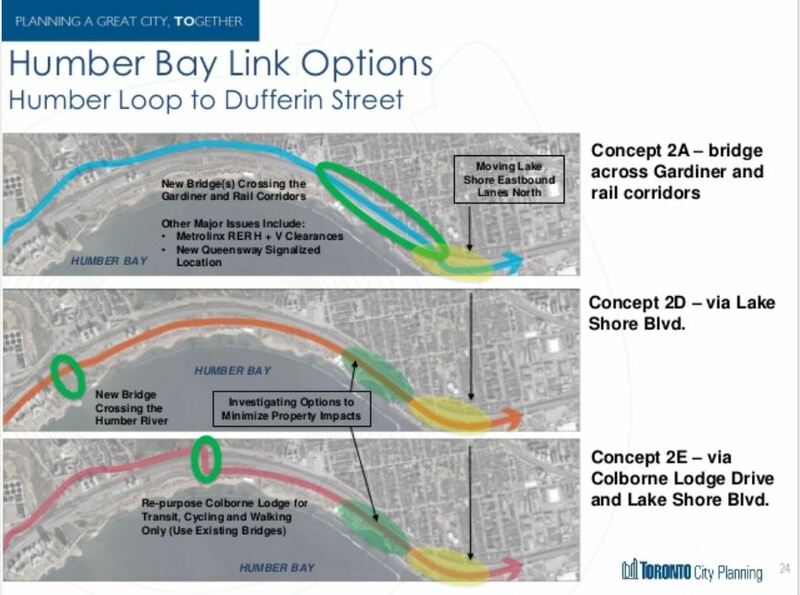 The map above does not show clearly that the link west to Sunnyside would attach directly at Dufferin Street to the proposed extension between the two existing loops. Council has already authorized design work to 30% on this link. A related issue here is that Metrolinx plans to revamp its facilities at the GO station, and the combined GO/TTC corridor will require an underpass for pedestrian traffic. In a truly hilarious turn of events, Ontario Place is now talking about transit access, an option it rejected a quarter-century ago when this line was first proposed. They were more concerned to preserve their parking lot than they were to make access to their site easy for transit riders. Exhibition Place itself is considering a new master plan, and this will trigger more talk of transit access. Unfortunately when they built what is now called the Enercare Centre on the site of the old Exhibition Loop, they pushed transit as far from the site and its attractions as possible. These situations are tributes to short-sighted planning and the second-class position of transit as these prime sites contemplated their future business plans. The intersection at Bathurst has been a mess ever since the Harbourfront line was built. The largest presence is Lake Shore Boulevard, a wide arterial road that gets as much green time for traffic as possible, at times more than is actually required. But it is a road and we must not disrupt road traffic. 3A: Operational improvements to the existing layout. 3B: Realignment of the streetcar tracks to better separate transit, pedestrians and road traffic. 3C: Grade separation of the 509 Harbourfront line and relocation of the 511 Bathurst route to Fort York Boulevard. The realignment scheme is the favoured option both for cost, and for its relative simplicity. Breaking the Bathurst link at Fort York Boulevard would eliminate the ability to through route service from Bathurst to Queens Quay, and it would put streetcars on the narrow Fort York Boulevard that was designed as a bypass road around the main intersection at Queens Quay. The underground option would also be expensive and difficult to build given its location (landfill in the former harbour, and an area of numerous underground utilities). The relocation would not stop at Lake Shore, but would continue south to Queens Quay and east to the “crossover” east of the Music Garden where the centre right-of-way shifts to the south side of the road. This would complete the reconfiguration of Queens Quay that was cut short as a cost saving measure just west of Spadina. The connection to Union Station from Queens Quay has vexed planners for years. 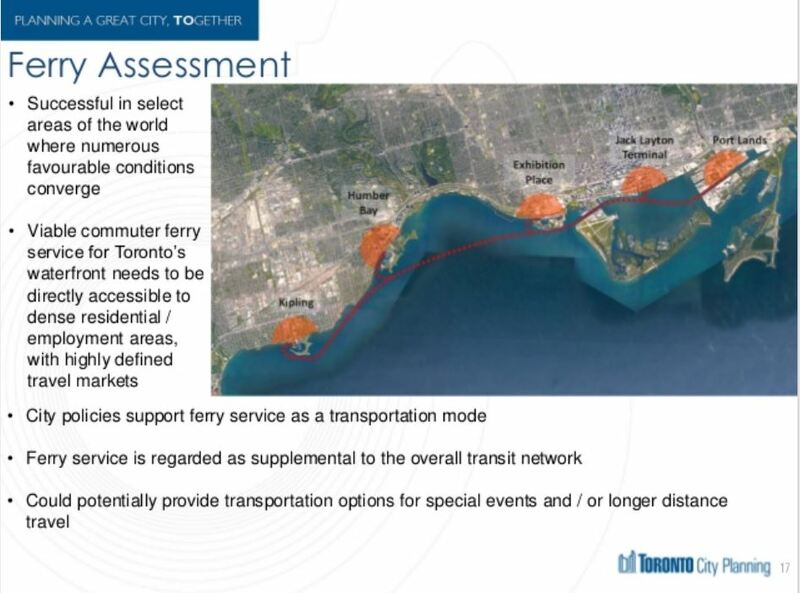 Improving the capacity of this connection is fundamental to the addition of any new service, notably one to the eastern waterfront where demand is expected to be well above that now handled by the combined Harbourfront/Spadina services. 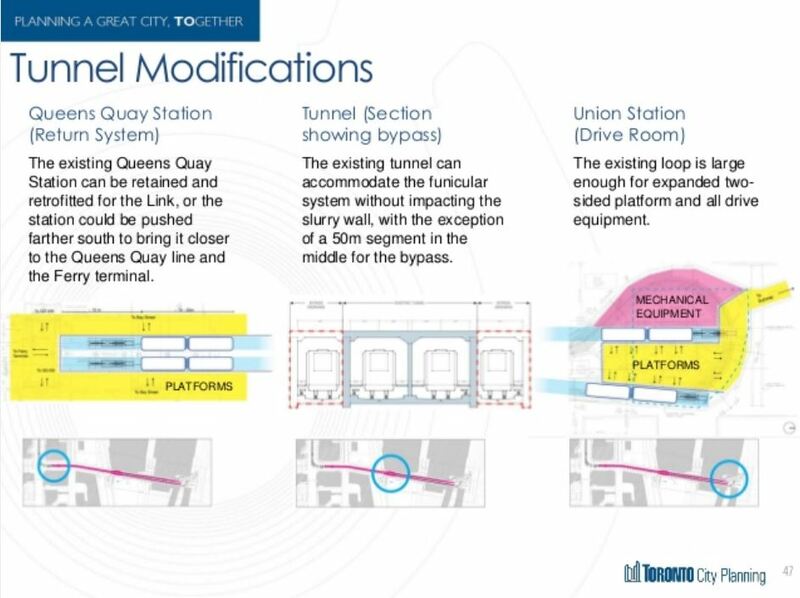 A further problem lies in the desire by parts of the Queens Quay community to eliminate the tunnel portal west of Bay and to avoid the creation of another one at Freeland Street, east of Yonge. From the amount of work already expended, I sense that “the fix is in” even though the project is still claiming it has not chosen an option and further analysis is required. Somebody very badly wants to re-purpose the Bay Street tunnel, and to hell with the result for the transit network and riders. We might well be seeing the “Kirby Effect” in action. Three options are under consideration for the Union to Queens Quay link, with sub-options for all of them. Union Station Loop is far too small to handle the project passenger volumes. Indeed it cannot handle some peak demands today. There has long been a proposal to add tracks on either side of the existing ones and to build platforms along the north-south segments. This would place them roughly under the existing sidewalks of Bay Street and, depending on their width, the teamways. In both options, there would be a long new platform on the east side of Bay with provision for two long loading platforms and crossovers so that cars serving each platform would not block each other. This platform would also provide a walkway from Union Station to the new bus terminal south of the rail corridor. In Option A1, there would also be a shorter platform on the west side of Bay that could serve a Bremner line, or could allow separation of westbound and eastbound services between the two sides of the loop. In either case, an important operational change would be to ensure that each service through the loop had its own platform. 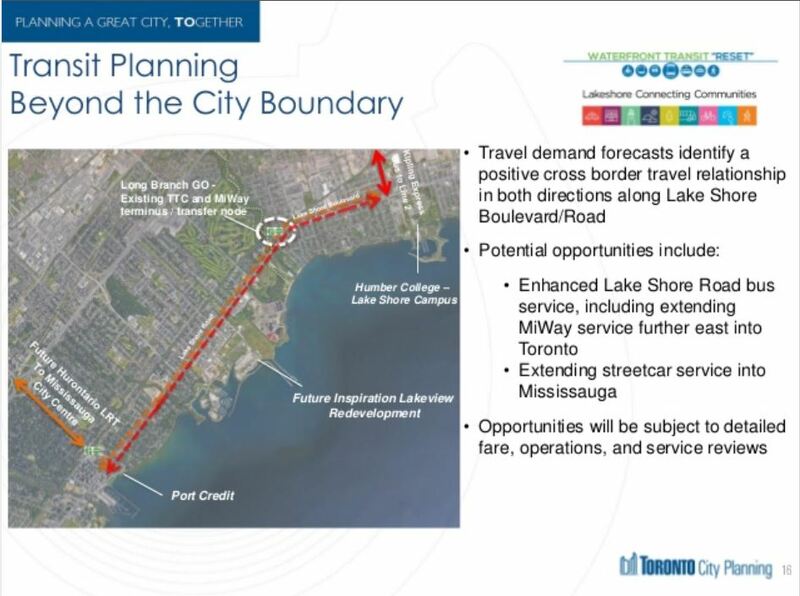 The reference to a “mainline station” in the slide below seeks to deal with blockage of services that occurs today when a car on one route (say 509 Harbourfront) takes a layover holding up a car on the other (510 Spadina). This would not be a consideration if each route were able to bypass the others. 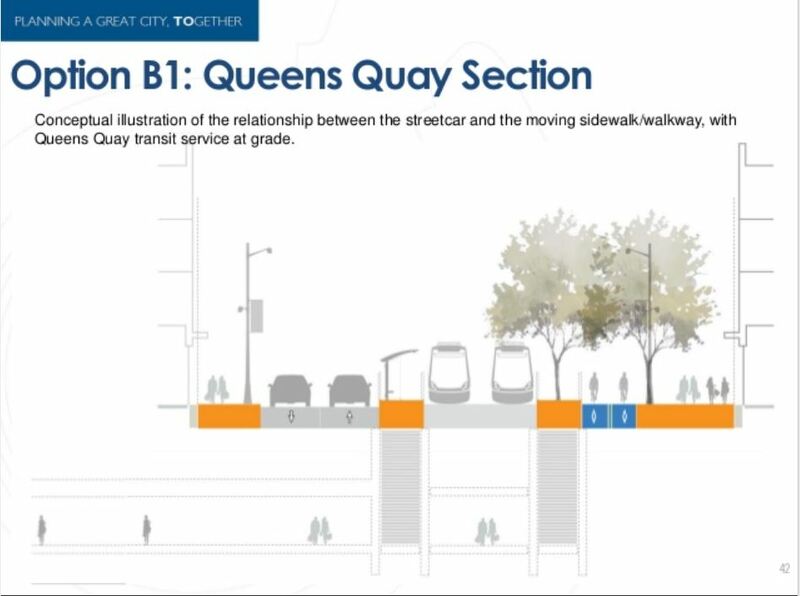 Option B would replace the streetcar link to Queens Quay with a combination of walkway and moving sidewalk. Physical constraints in the tunnels prevent installation of two moving walkways within one tunnel. The proposal would have only one such facility and it would operate in the peak direction only. No, I am not making this up. The direct link from streetcar service to the subway at Union would be replaced with a walk of 530m, longer than three subway platforms, for anyone who was not travelling in the “peak” direction. The proposal includes breaks in the moving sidewalk to deal with curves and grade changes, and would provide for “connections to destinations along the tunnel”. Only Option B provides this capability in the plan, and the City needs to be clear about whether this is an actual “requirement” or simply an add-on to make the option more palatable. It should be noted that similar functionality would be provided, at least in part, by the extended platforms of the “A” streetcar options. 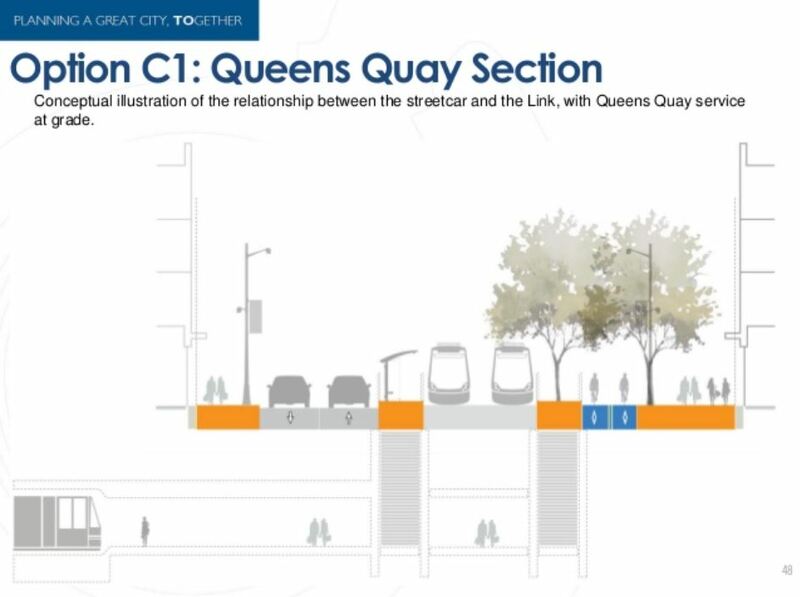 At Queens Quay, there are two options for a station (these also apply to Option C) with the station either on the surface on Queens Quay or underground. If the station is on the surface, vertical access would be provided by stairways, and anyone require an accessible route would have to use elevators or escalators in nearby buildings and then navigate to the streetcar station across road lanes. The wait at a major transfer point would be in the open air, a considerably less attractive arrangement than with streetcars running through to Union Loop. 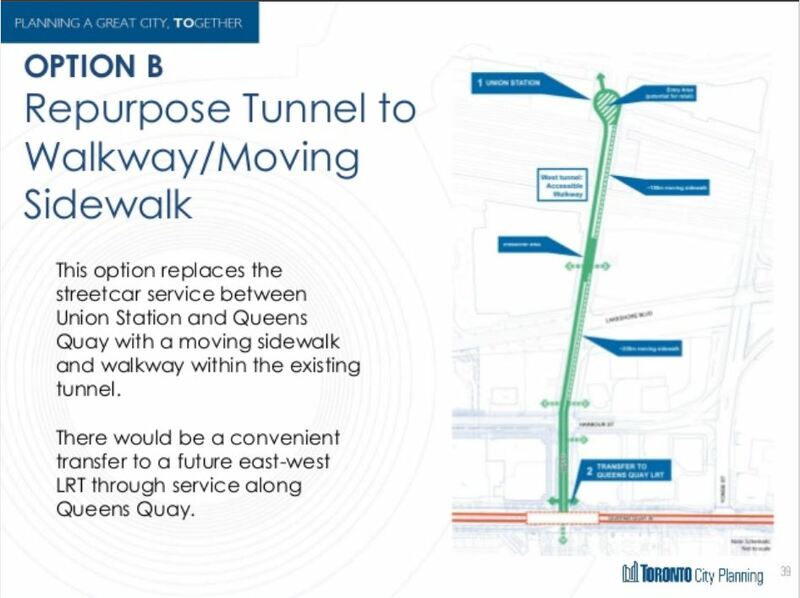 An underground passageway could also have an exit south of Queens Quay to the plaza at the ferry terminal. None of the blocks between east-west streets is long enough to fit the portal and ramp up to the surface with a grade streetcars can operate. The volume of transit movement at the Bay and Queens Quay intersection, coupled with large pedestrian volumes here, would make the area very difficult to operate. Any surface station on Queens Quay requires sufficient circulation capacity to move a substantial number of riders to and from the walkway or cable car station below, including good provision for those with mobility issues. If the streetcar goes underground, the passageway would end at the westbound platform, and riders wishing to reach the eastbound platform would have to cross the tracks. The volume of pedestrian traffic would be considerably higher if, as is likely, a ferry terminal connection were included. City Planning staff are rather dismissive of TTC concerns about the transit/pedestrian crossing and cavalierly say this could be handled with platform doors or gates. This raises questions about the TTC’s role in the process and whether the City is driving the replacement of streetcars in the Bay Street tunnel no matter what. One issue with a surface streetcar station is that the area between Bay and Yonge is now used to access the Harbour Castle hotel. One proposal, not shown in the presentation, would involve filling in the Yonge Street slip and reorienting hotel access to the land this would create. Filling in the slip would also make construction of any underground structure here, including a streetcar tunnel, somewhat less challenging by moving the water further south of Queens Quay. This proposal should be common to whatever option is chosen. Option C replaces the streetcars in the tunnel with a cable car system. The intent is to operate a frequent shuttle service between Union and Queens Quay using four trains, two in each tunnel. The trains would pass at the midpoint, roughly at Lake Shore Boulevard, where the tunnel would be widened to provide passing tracks, but otherwise this would be a through trip with no intermediate stops. The option of connections to adjacent development are not included, and this begs the question of whether they are “must haves” or “nice to haves”. The diagram below claims that the capacity is 8,250 passengers per hour per direction, far above the need of the transit link. 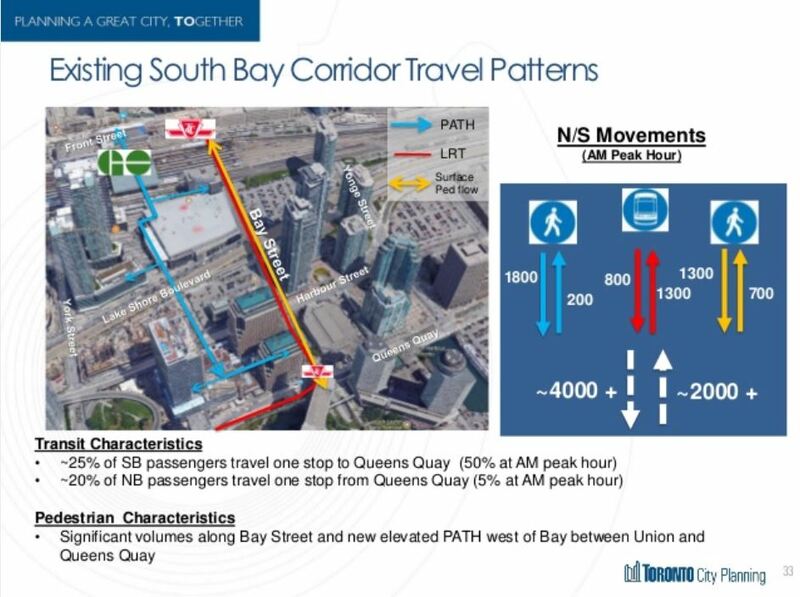 It is quite clear that the City sees this as a supplement to the north-south pedestrian capacity from Union to Queens Quay, but does not explain how this would fit with a closed connection into the subway. The reliability claim shown below is simply not credible and smells annoyingly like the hype from a would-be supplier, not a realistic long term value. At an operating speed of 10m/s, the 530m trip would take almost a minute (allowing for acceleration and deceleration) plus dwell time at platforms. The stated capacity requires 66 trips per hour, or a 54 second headway, and this number clearly inflates what the line can handle. The full capacity is not actually required, but such basis mistakes raises a question of whether this proposal has been examined beyond the level of marketing literature. The stations at the north and south end of the shuttle would occupy the existing Union Loop and Queens Quay station space, and relocates the mechanical rooms now in the middle of Union Loop to the west side. The technology is touted as “readily adaptable”, and City staff claimed that “thousands” of such systems exist around the world. This is simply not true, although funiculars are used to deal with difficult links with major changes in grade. 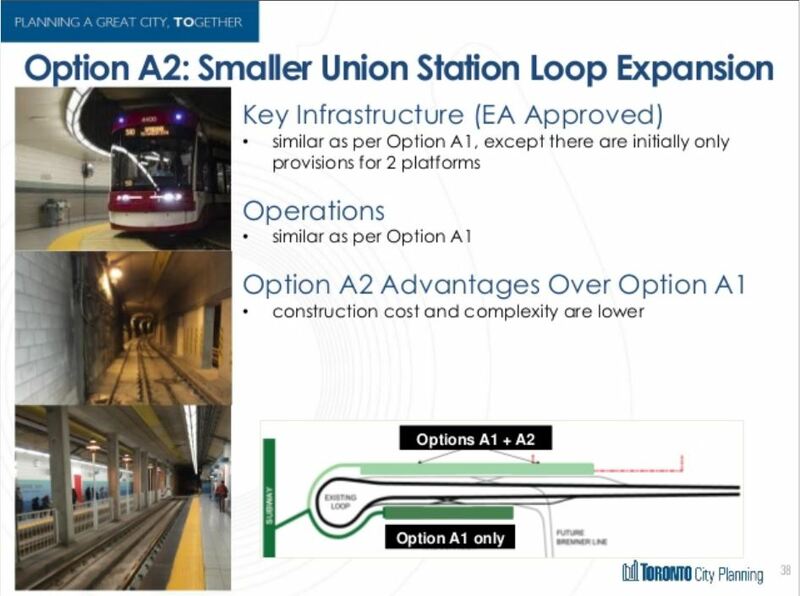 The station at Queens Quay presents similar issues for Option C as in Option B. The impetus for these proposals comes from two sources. One, a problem that has bedevilled waterfront transit plans for years, is the cost of expanding Union Loop. This is work that should have been done while the Harbourfront line was closed for reconstruction of Queens Quay, but that got underway during a City Hall administration for which expanding streetcar capability was simply not an option. The amount of money needed is considerable, and figures like $400-500 million have been kicked around, albeit for a more complex version of the loop than the A2 version above. Moreover, the Bremner streetcar complicates whatever is done at Union, and it is clear from Options B and C (and the low demand projections) that this line is dead in the water and should be removed from the plans. Pre-building of the eastern waterfront line at least to Parliament so that streetcar service would have some place to terminate. 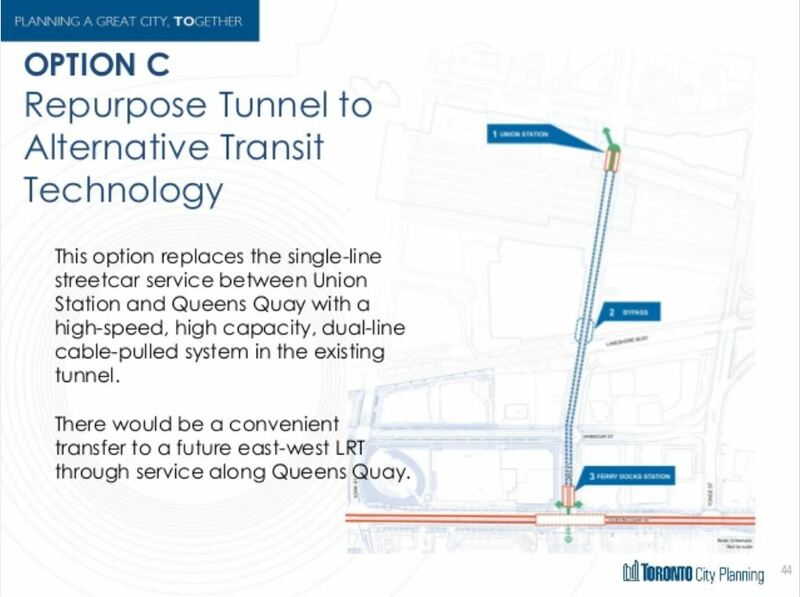 A minimum of one year shutdown of the tunnel itself to retrofit the new technology, whatever it might be, and no streetcar service east of Spadina until through operations were restored on Queens Quay. Walking through the PATH network linking Union Station, the ACC and various buildings to emerge in the food court serving 10 and 20 Bay Street (blue line below). Taking the streetcar from Union. The proportions are shown in the chart below with the note that a half of riders only travel between Queens Quay station and Union during the peak hour southbound, but only 5 per cent do so northbound. Anyone who has ridden streetcars eastbound along Queens Quay to Union will be well aware that this is a well-used service whose trips do not originate at the ferry docks and nearby condos that are already in walking distance of the subway. 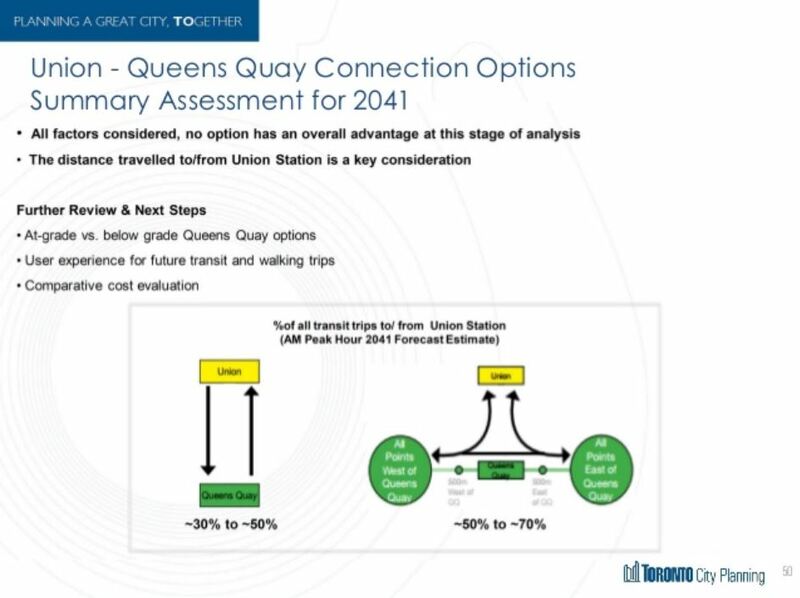 Looking at 2041, the City foresees very substantial increases in travel between Front and Queens Quay with about 40 percent of the peak direction travel by transit and over half of the counterpeak travel. What is missing from this chart is a dis-aggregation of trips to show which path would be most likely taken by each group. Indeed, many of the trips shown will remain as walking trips. There appears to be an attempt here to justify a major increase in the capacity of the tunnel (possible in theory with the cable car option) based on projections of pedestrian volumes. However, this ignores the very real question of whether people would go out of their way to use the cable car rather than simply walking, especially if their destination was not directly served by it. This simplistic analysis reinforces the sense that there is an already-established preference for Option C within some part of the project team, likely the City as their staff put forward the capacity issues and are the greatest apologists for this option. The TTC is not amused, but has not put that case forcefully in public. This is a biased presentation aimed at one technology and it skews an otherwise reasonable set of proposals for the waterfront as a whole. What to do at Union? There is no question that greater capacity is needed in what, broadly speaking, is the “Bay Street Corridor”, but this must be understood for all of its components. 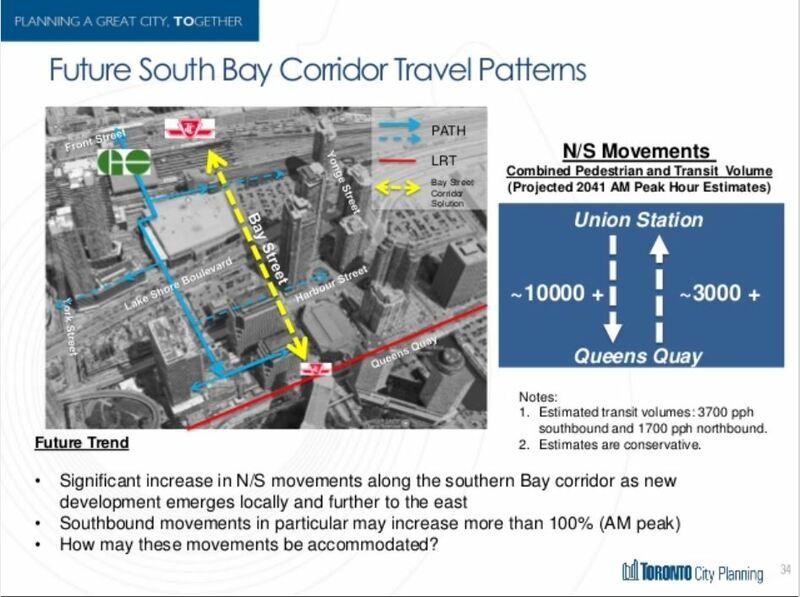 How many of the 10k/hour projected are bound for locations between Union Station and Queens Quay, notably the new developments at the corridor and immediately south of it? What are the implications for recreational trips including those bound for events at Exhibition Place? What additional inconvenience do future riders of eastern and western waterfront lines face to make their “last mile” connection at Union? One option that does not even appear in any plans is a continuous underground passageway separate from the transit tunnel. Option A will create a platform extending all the way from the existing loop under the east side of Bay to the new bus terminal at Lake Shore. New developments planned between there and Queens Quay could be designed to continue this link further south. This would provide new weather-protected walking capacity extending the PATH system while maintaining the streetcar operation for riders bound for points east and west. The planners must go back to their drawing boards and provide a much more comprehensive review of movements both for commuter peaks and recreational travel to understand how components of the “solutions” at Union would be used. The TTC needs to be much more vocal in their opinion of the viability of various options so that we are not railroaded into a “solution” that they will gripe about for decades to come. If there is political influence behind the scenes, it should be smoked out so that the public will understand what is really driving transit decisions in the waterfront. Steve: The following comment was left in another thread by “DopeyFish”. Proposal seems fine for lakeshore. It’s basically same thing (western leg of 501 connecting to 509 Harbourfront) for old waterfront LRT outside of having to use the ROW that 501 currently uses on the way to Roncesvalles. 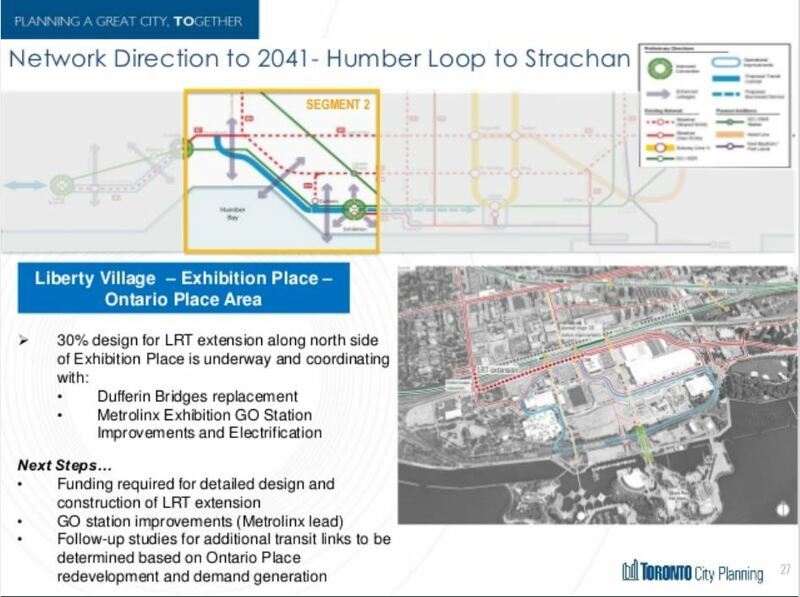 Like that they bring up the potential link to Hurontario LRT and HBS hub… but we all know that will likely go nowhere as is the case of any long shot in this city. Now all that stuff around Union… eurgh. That looks like it will be a mess. 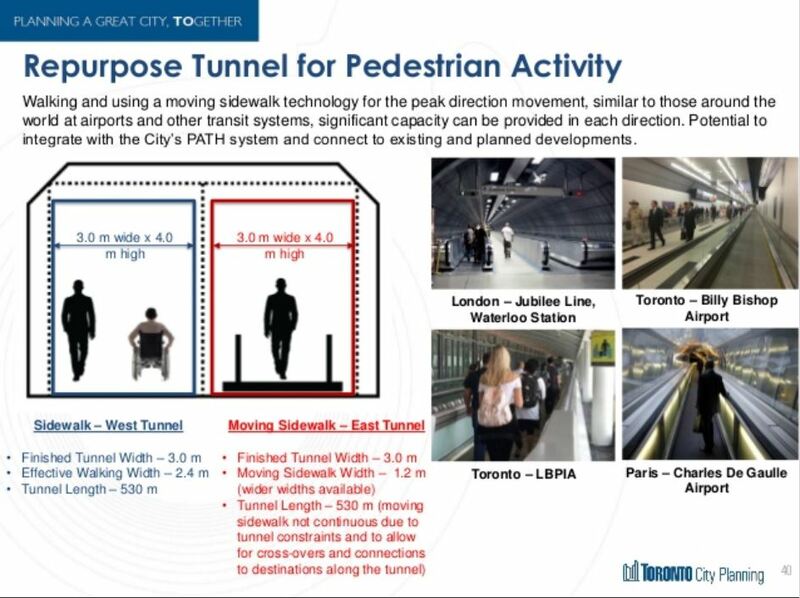 My fear about the moving sidewalk option for the Bay tunnel is that it will be like the Spadina tunnel and once it reaches the end of the its service life they’re rip it out instead of replacing it. I have a similar concern about the funicular option. I personally like quirky transit modes like cable cars but I don’t have much confidence in the TTC’s ability to maintain/replace it 40 years from now when the cars reach the the end of their service life. Steve: I would be astounded if the cars were built to last 40 years. About the route from Colborne Lodge Road through South Parkdale to Dufferin, there was a suggestion during the Miller administration that Lake Shore Blvd. W. be realigned closer to the Gardiner Expressway. This would create more USEFUL parkland, unlike the grass field median used currently to feed the Canada Geese. Steve: The plan for this segment is based on the Miller-era Western Waterfront plan which does what you describe. The suggestion to replace the current streetcar tunnel with moving sidewalks or walkways is just ridiculous. Why didn’t they replace the moving sidewalks between the Line 1 Spadina Station and the Line 2 Spadina Station? If they are not going to put a moving sidewalks back in at the Spadina Stations, then they shouldn’t put in moving sidewalks at Union Station. 4) Potential for some sort of T Junction at QQ for future options with through routing etc. Steve: I’m going to assume that this is satire, especially the link to the island. I attended the meeting last night and really appreciate your fabulous analysis as I was a bit confused by some of the presentations (and I am a retired transportation planner!). As you note, the Union tunnel options look tainted by some hidden agenda. An option I would like to see evaluated would be a surface link on Bay St to Queens Quay East from one of the existing links like Wellington. With pedestrians able to use the west tramway, I figured a two way track could fit on the west side of Bay using the existing sidewalk. Of course a south side street car track on Queens Quay would impact the Westin Hotel. 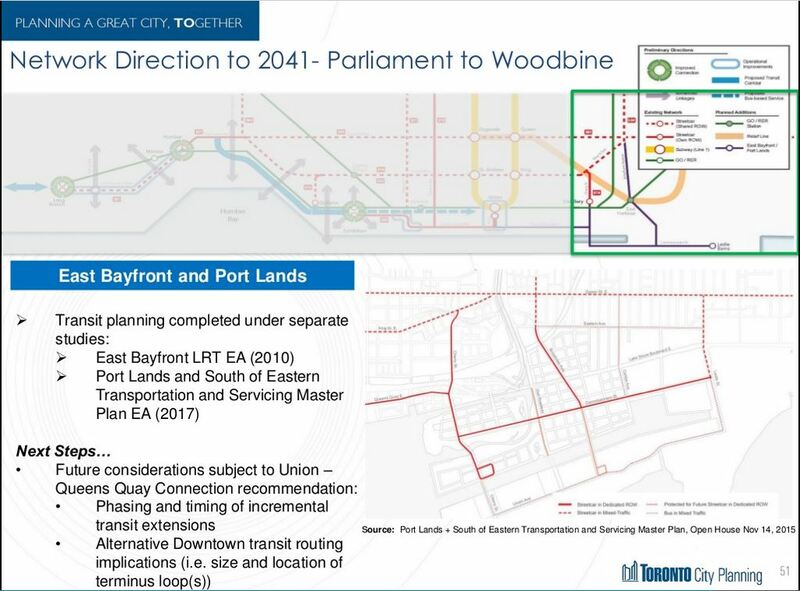 Another option would be to serve East Bayfront only from the east with a loop around Bay, Harbour and Yonge with passengers transferring from the Ferry Docks station. I think an underground link to the actual ferry docks is essential because the summer pedestrian volume on the surface is insane. Steve: The demand to the east is actually expected be higher than to the west and it will need its own dedicated service, not a huge volume of passengers attempting to transfer on the cars coming in from the west. The whole round of consultations during 2016 for the whole grab bag of projects (Waterfront, SSE, RL, Eglinton and a few others I’m forgetting) felt the same to me and left a bad taste in my mouth. I’ve complained here about my feeling of rigged analysis for the SSE/RL where it looked like things were heavily biased to favour the eventual winners. Some visitors might also remember my colourful words when I first heard of this plan for a moving sidewalk. That it made it this far in the process is a disgrace to the planning staff whether of their own volition or not. Selling out transit users like this? Of all people you would think these guys would get it and be better than that. If somebody told them to jump off a cliff would they jump off a cliff? Can the TTC please take back planning of transit infrastructure again? I’m ready. At this rate I’d be happy to see planning for all of the proposed transit projects taken out of the hands of City Planning who can’t seem to act in the best interests of the people who will be using what these jokers are doodling on their napkins and Powerpoints. Steve: The transition took place under Jennifer Keesmaat’s watch as Chief Planner, and it will be interesting to see what happens after she leaves. I’m a bit overwhelmed still with a renoviction process that’s pretty ugly, including the City in some ways, so I am very Behind. But maybe we should reset this reset as it seems to be a Fail in really looking at the different types of demand, and only goes back 25 years or so, on motion of Pasternak, and that misses the WWLRT EA analysis that there were TWO types of demands. 1) the local/milk run along waterfront, and 2) higher speed direct to core, and that which would compete with the Gardiner/Lakeshore, and relief King and Queen, and the DRL west end used Front St., which was modelled for time savings. Front St. is laden with destinations, and while we’ve had a lot of growth south of the tracks, the central core remains intensive, including off-peak destinations. So maybe we should insist that we see massive investment here, in to the centre of the City, and have a new corridor and have it fast/sub-regional, including Front St. and including the Gardiner, and including having a reversible transitway, which is more possible Parkdale to core because the proximity of the King and Queen streets as return routes enables a loop. Which can be reversed. North of the tracks east of Dufferin could allow for a pretty fast direct trip vs. the convoluted and now perhaps far too complex and costly changes to the tunnel already in lakefill, which will have a Surprise factor. We just don’t want to think about providing really effective transit here. We are shutting doors on new routes with the Rail deck park too, as the easiest part of that to do is the most needed part of any transitway eg. just south of Front St., which could enable a bit of extra width for a transitway lane. The one good thing with the Raildeck park idea is that it shows both the City and railways are quite OK with decking over live rail corridors so we could really have a good set of crossings over and back in south Parkdale in the approach to the Ex and Dufferin St. from say, the Wilson Park and King St. area. Touching on the west end of the Ex would be smart, including for Ontario Place. If we really planned a transitway, (two-way is better, but we should know better in Caronto and aim low, and use Jarvis as an example of reversibility being good), we’d also allow for GO buses to access it around the Dufferin area as they’re too caught up in car traffic. The lowering of the railtracks to solve the grade crossing issue at Strachan is/was a chance to easily cross over these Weston railtracks to get to Front St. AND serve Liberty Village, which is in real need of connectivity/transit. But it sure feels like fixes are in, again. And inferior, stop-gap, we are too doing a tiny bit of something here while beggaring the entire system in Scarborough, transit is acceptable? What about the EPT King St. subway idea? It wasn’t actually a ‘plan’ that the City recognized, right. Oh, Queen St. subway; not caught by the limited time frame. DRL – only the east end is acceptable right now, and we cannot manage to think of providing superior transit to compete with the Gardiner/Lakeshore and both lure the SoV car driver out and provide the better transit ahead of tolls. If the car, oil and construction industries wanted to keep status quar practices, would they be doing anything different here? And while I’m sure there’s all sorts of travel demand and logic for a serious subway in a logical place, this is Caronto/Moronto, so let’s think surface options first, and yes, that would for me also include a transitway – somewhere/somehow – on the Gardiner. But no, Places to Grow is at whim, so no transit thinking, just status quar as the votorists must not be alienated. The 1993 WWLRT EA also suggested that by providing fast, direct robust rapid transit in from Etobicoke, there’d be some relief to Bloor St. subway conditions too, as many Etobicokians go up to the subway, in, and then down because the surface transit is too spotty/slow. There’s another faster option possible: north side of the Weston railtracks from Queen St. to Front St. and then along Front, but because it is ‘late’, and the politricks are such that we will slow down the GO trains to provide that Liberty Village stop instead of better transit as was needed a time ago, options are not going to be explored, and a road instead of transit will occur from Dufferin to Strachan, though at least it will still be publicly owned. My guess is that a large portion of the southbound traffic (that doesn’t head east) from Union is headed to the offices (newly constructed and planned) in the area bounded by Yonge (maybe Cooper) and York. So they may not be candidates for transit at all. If they don’t run service to Union, that means they can’t run different levels of service to the east and west!? So they need to run twice as much service as required west at least as far as Spadina, just to get adequate service to George Brown and the offices in the east. And the 510 would either have to turn back at Queen’s Quay or run all the way to Parliament. And it only gets worse as the Port Lands and Don districts get developed. The thing I really don’t get is what monkey would _want_ to screw things up like this? The fix may be in for this, but for gods’ sake *why*? As Oliver Moore has pointed out, Bay St. between Queen’s Quay and Union will apparently have half the demand of the Scarborough Subway extension. 1. Completing the link between the Dufferin and Exhibition loops. 2. Building the streetcar platform on the east side of Bay St.
3. Finishing the Queen’s Quay west track shift and making improvements to the Bathurst/Lake shore/Fleet intersection. No funicular, and, for the next decade or so, no portal connection to Queen’s Quay East, and very likely no new infrastructure & lane shift on Lake Shore west of Dufferin until new funding is available. Perhaps streetcar only lanes could be added on King between Queen and Dufferin to improve the speed of the 504 & the Waterfront “LRT” in the interim. Steve: Low demand east of Bay Street? At 2,350 for the peak hour outbound, that is the highest projected demand other than the combined volume southbound on Bay. The frustration for everyone who has worked on the eastern waterfront LRT proposal is that there has been so much foot-dragging on building it. Developers (existing and potential) have reached the point of complaining that they cannot lease commercial space without a better transit connection to Union. But instead we get proposals to gerrymander the Bay Street tunnel’s role. 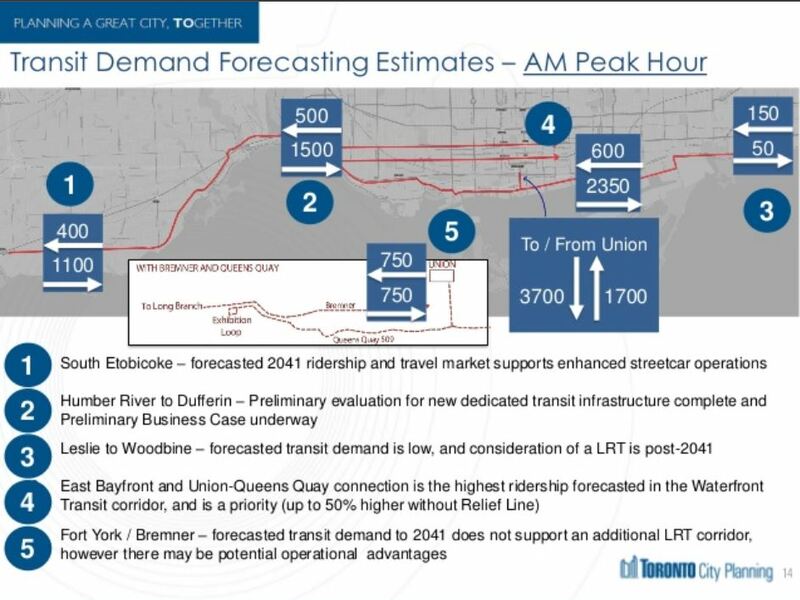 City staff speak of projected huge increase in transit volumes outbound to areas such as Liberty Village in the peak period and in the King/Queen corridor generally, but these figures don’t see the light of day where they could inform plans for streetcar system improvements. One further planning point for any long-needed improvement to faster east-west transit from the pinch point at base of High Park to the core. Some plans take the Queensway car to the south of the tracks etc in the area of the pinch point, but it makes far more sense to have any crossing to the east of Roncesvalles and a crossing-over in the Wilson Park to Roncesvalles area. That is because of the possibility of having a second demand met on Roncesvalles – to get up to Bloor and/or down from Bloor and then to/from the core. I know it’s illogical to think of having a two-for-one deal or consideration, but I’d suggest if we’re at all sincere/earnest about tackling the horrible congestion and transit issues in this lower west waterfront core, we have to actually do the planning and FULL exploration of what’s possible, and not just go along with ‘we can do this tiny bit because this is the crumb the Clowncil is likely to give’. There have been serious plans for over a century to improve the east-west transit in this historical core area; so it’s time to actually do some real things vs. a Suspect Subway Extension. Steve: No! No! No! Bringing the WWLRT through the KQR intersection and then adding a new junction further east will worsen an already appalling situation. The whole point of dodging south at Colborne Lodge Road is to avoid this area completely. Thankfully, there’s another bash at it in today’s Star in a column by Michael Warren and one good phrase is “a $3.3-billion, one-stop subway option that shouldn’t even be on the table”. The 23-19 vote to ignore facts in infrastructure decisions last December should be raised at all times now; and it’s mostly the suburban Councillors in the majority, along with Mayor Tory. So why do facts matter so much with a small bit of bike lane in the most logical place in southern Ontario, but out in Scarborough, with billions in play and a massive drain on TTC/planning time, it’s far more whim? The provincial Liberals are also really tainted; pressure should be applied to some of them eg. Mr. Peter Milczyn and Mr. Dong in the central core. I’m not so sure the other parties are all that much better of course: Gord Perks and Mike Layton are keen on the new road in the Liberty Village area that is basically the exact area for a good transitway as I see it that feeds in to Front St., and yes, mostly on surface given the decades of time gone. The ‘carservatives’ will be trying to claim to be fiscally prudent, but will avoid the many many car costs in all other budgets and may try to have a repeat of the fill-in of Eglinton and shaft us with the Sheppard stubway folly. I’ve been following your blog Steve for almost 10 years. The plans for the Union segment have to be the largest pile of dog sh*t you’ve had to write about. Now we’re potentially considering spending money ripping out the streetcar tracks in QQ tunnel and replacing it with some kind of Disneyland “funicular”? I guess the city planning staff were inspired by a weekend trip to Niagara Falls ? Why don’t we bring back the Rob Ford Monorail while we’re at it ? Absolutely… Based on 2012 ridership figures, the combined daily ridership of 44 Kipling (9400), 110 Islington (9000), 76 Royal York (10,100) and 66 Prince Edward (4700) was 33,200. The entire 501 line was 43,500. So those 4 northbound bus routes that originate in S. Etobicoke and terminate at Line 2 carry greater than 75% of the daily ridership of the 501. Of course many patrons are boarding outside the 501 catchment or alighting at schools or not heading downtown. 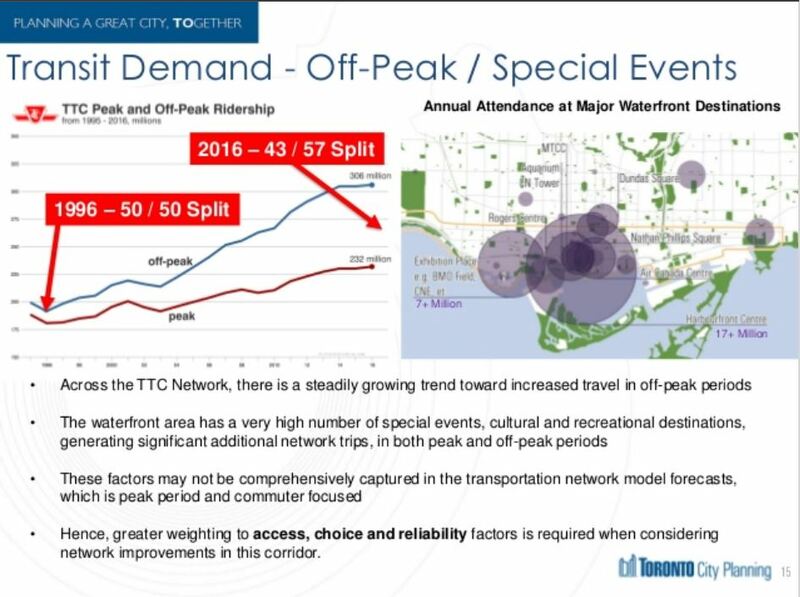 But I have a hard time believing that existing 501 ridership, new ridership capture from car commuters and new development, and conversion from bus+Line2 and car+GO transit users produces only 1100 eastbound passengers over peak hour until 2041 as cited in these presentations. Doing little or nothing to improve TTC transit in the corridor is the best way to make that projection come true. Do you not see a need, in the next 25 years, to protect transit in S. Etobicoke from increased traffic congestion and its effects on service reliability? If you do see a need, what would you consider the best ways to achieve improvements? What about peak-hour transit-priority lane in the appropriate direction? And corresponding elimination of peak-hour parking on one side of the street in addition to peak-hour turning restrictions at non-signalized intersections, with correspondingly longer turning advances at the signalized intersections? Regarding the Humber to Dufferin section, the drawbacks of 2E and the benefits of 2A are understated in the 2E recommendation. The biggest problem is that they are still referring to a 2A option that runs along the rail embankment to Dufferin which, as noted in the evaluation, is no longer possible because of the wider buffers needed for RER electrification. Much of the Feeling Congested scoring that hurts option 2A is related to the embankment which is now moot (for example the “public health and environment” criterion, which gives 2A a 1/4 and 2E a 4/4, with 2A suffering due to rail embankment related environmental and property impacts). In reality, the only true 2A option at this point is a hybrid of 2A/2E, which is exactly the same route, except crossing over at Ronces instead of Colborne Lodge. That would be the best option, and they should have updated the Feeling Congested evaluations accordingly. It was already considered in the 2008 consultations as option 3A(i) so it’s hardly new. I doubt the Colborne Lodge Dr. to LSBW connection could or would be made a true transit priority. Travel time reductions achieved to the west will likely be cancelled out by dwell time at these two intersections. 2E also leads to the needless creation of parallel track – and its associated construction and maintenance costs – from Colborne Lodge to Roncesvalles. This duplication is framed in Orwellian consultant speak as “new placemaking” which is dubious considering those new-and-not-yet-made-places, like Sunnyside, are currently a mere 3-5 minute walk from the 501. Most worrisome, 2E weakens the transit network connections between the new route and the existing 501 and 504 at Ronces/Queensway/King/Queen and places St. Joe’s – a hospital of all places – a difficult transfer away. 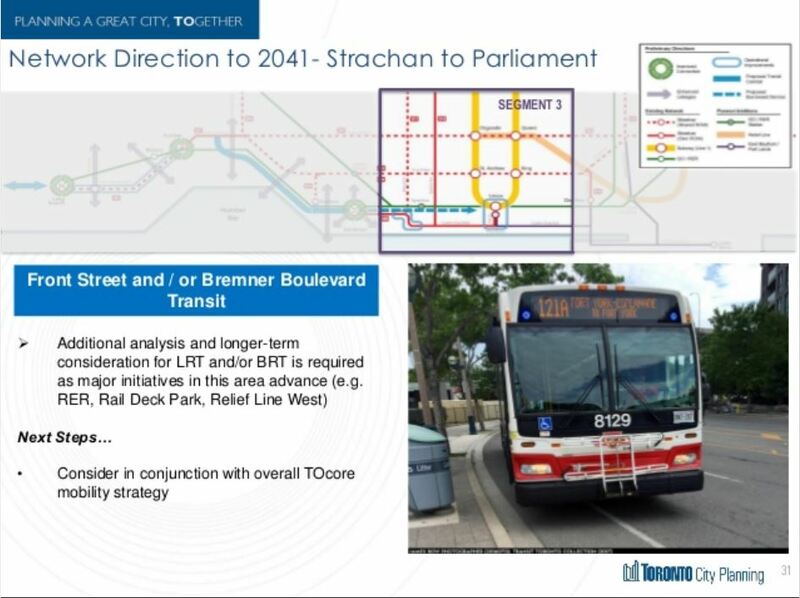 2A also seems to be the TTC’s preferred option which is important from a service standpoint. The Ronces/Queensway/King/Queen intersection and Gardiner/Rail crossing are obviously complicated, but no more complicated than other parts of WWLRT, let alone other transit projects. Why is it not worthwhile here, at an important transit transfer point for western residents? The 2A route needs to be reassessed and studied with much greater conviction before it is eliminated as an option. Steve: I strongly disagree. Every set of data I have reviewed for traffic on King Street east of Roncesvalles shows that this is a badly congested area, and adding another service and intersection to this segment would do a lot to demolish any sense of “rapid” transit. 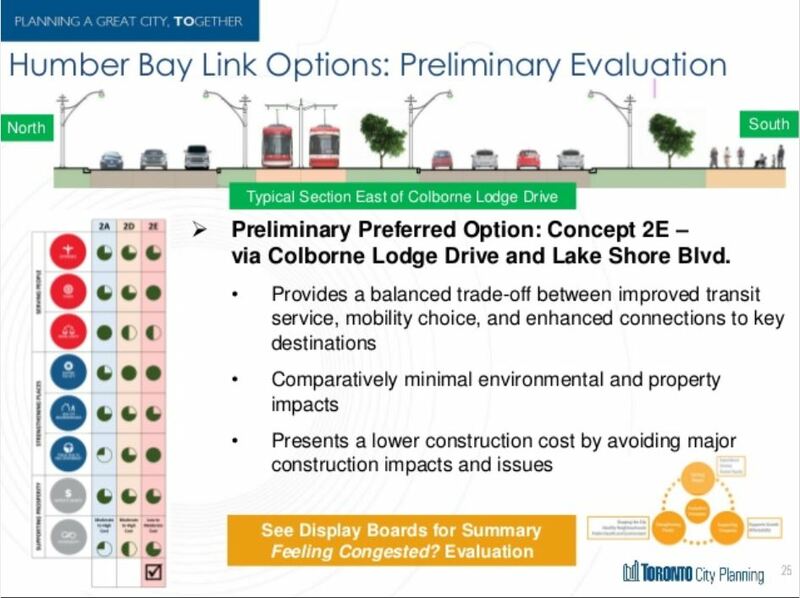 If we start from the assumption that Colborne Lodge would actually get transit priority (a negative view of an option you dislike), how can you assume that significant changes will be made on Lake Shore in southern Etobicoke? I do not dismiss “transit priority” as a concept, but the way it has been implemented in some Toronto locations has more to do with moving car traffic and hoping that transit will get a “trickle down” benefit than it does with really moving transit faster. 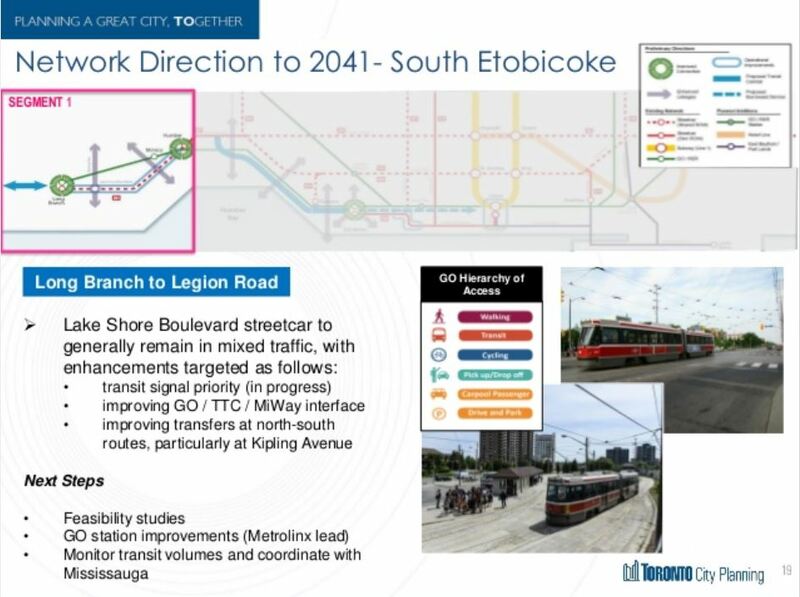 Since, as you note, it’s not in the slide deck, do you remember any details of how they squeezed streetcar tracks into the available space between the Gardiner on the north and the Boulevard Club/Legion hall on the south? I’d swear there isn’t enough space for 2 more lanes even if they take out the trail. (And there isn’t enough of a height difference to stack lanes above the Gardiner.) Are they planning on expropriating the Legion hall? Steve: I know that this was flagged as a problem before, but can’t remember how it was addressed in the new plan. I will have to chase this detail. It seems like the condo area just west of the Humber will be getting a ROW and likely the extra service of both the regular Queen route and the new waterfront LRT route. West of Park Lawn, though, the pickings are pretty slim. If the waterfront LRT did indeed terminate at the new loop at Park Lawn, service on Lake Shore to Long Branch could conceivably become worse, not better. The other items on their checklist are pretty trivial. The improved connection with GO Transit is more dependent on a rebuild of Long Branch station than anything to do with the streetcars, as I doubt Long Branch loop is going to change or move any time soon. More safety islands would be nice, but there is limited room for them in many parts of Lake Shore, and I worry that stops that are not at traffic lights will simply be removed “for passenger safety” — although the eastbound stop at Thirty First did survive and is the new expansive design. How transfers to N-S routes will be improved is a mystery to me. Kipling and Lake Shore is a busy intersection. The only possibility I can think of is to switch to far-side stops, which would help riders make east-to-north and south-to-west connections. However, there’s a disadvantage in far-side safety islands in that it takes a lot longer to get off the streetcar and then to the sidewalk than nearside curb stops. I think first and foremost that engagement with the city should be on the basis that Bremner comes off the table. Its continued presence is only complicating consideration for lines that will actually be constructed. 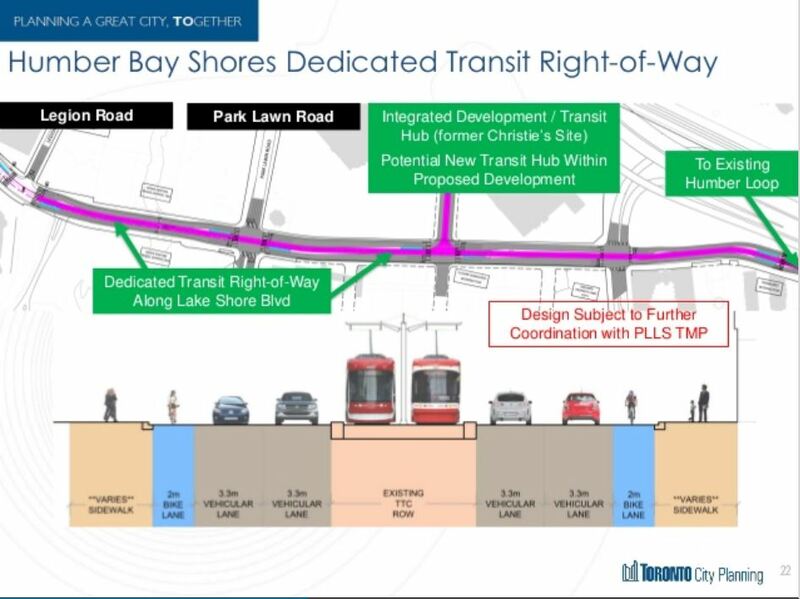 When I heard about the idea to underground the streetcar at Fleet-Bathurst, it occurred to me that a better way to relieve pressure on that area might be to underground the through lanes of Lake Shore Boulevard instead. The scheme to connect Springhurst and Exhibition loops will be interesting. Will the 514 be abandoned, as it was suspended for the Ex, on the grounds that it can’t coexist with the Dufferin bus and the WW service? Given the handstands being done to get more transit to Pearson, it would have been nice to see the Island Airport called out in the panel for Fleet-Bathurst. But then the TTC, possibly not wanting to vex the Ward councillor or the local MP, might think it best not to exert itself on that file. Steve: I asked about taking Lake Shore underground too, and learned that going underground at Bathurst/Fleet is quite complicated thanks to both utilities and the fact this is old lake bed. So everything stays on the surface. If streetcar service to Union Station is discontinued and replaced with something else between there and Queen’s Quay, that’ll increase the number of transfers between locations on the waterfront and the subway from one between the streetcar to/from the subway at Union to two. Since the Scarborough subway debacle clearly indicates that no expense should be spared to keep transfers to a minimum, obviously it’s a no-brainer to do whatever it takes to rebuild the Bay St. tunnel and Union streetcar station to handle the increase in streetcar traffic as a cost-no-object proposition, right? In all seriousness, I’m concerned that the complexities and associated costs of dealing with the streetcar station at Union plus the cost of building substantial amounts of new streetcar line in general are going to lead to either a cheap and nasty “solution” that’s woefully inadequate or unsuitable for purpose or more stagnation with nothing at all being built any time soon. This, in a areas that are already dense and getting denser with condo and office populations, despite the city and province’s willingness to spend phenomenal amounts of money building the minimal marginal subway extension possible of one stop in Scarborough where density is low. I would like to propose an above ground gondola system between Union Station / Bay Park Centre and Jack Layton Ferry Dock / Westin Hotel. Last week I attended the waterfront public transit reset meeting at Queen’s Quay Centre. 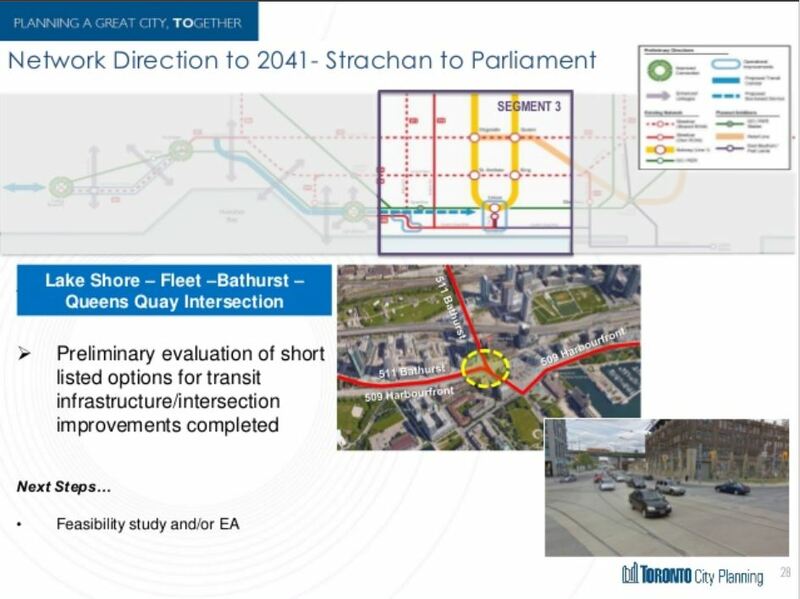 All of the options that were presented for services between Union Station and Queens Quay resulted in enormous engineering and passenger logistics issues or the elimination of the existing street car infrastructure. – an above ground gondola system be installed between Union Station or Bay Park Centre and the Jack Layton Ferry Dock / Westin Hotel with a possible stop at a PATH accessible site such as 10 Bay St.
– close the Queens Quay streetcar station to pedestrian traffic and remove passengers from the Union Station / Queens Quay station corridor from the existing TTC infrastructure. – continue to operate streetcars along the length of Queens Quay to Union station with a t-junction and no stops at Queens Quay and Bay Street. Passengers would be redirected to the gondola. – Continue to utilize existing TTC infrastructure and eliminate the TTC bottleneck at the Queens Quay station. Move passenger traffic from Union Station to the Bay Park Centre. Maintain full TTC control and service over current infrastructure between Union Station and Queens Quay. – An urban gondola with views of the lake, the old postal station and Union Station would be a valuable tourist attraction enhancing access to the Island Ferry and Harbourfront area. As demonstrated in London’s Canary Wharf, an urban gondola system is able to attract considerable revenue from naming and advertising rights (Emirates “Air Line” Cable Car). – Current passengers between the Queens Quay station and Union station would be diverted completely from current TTC infrastructure which would allow a focus on providing streetcar service to the broader waterfront area between Parliament Street and Exhibition Grounds. – Established gondola technology and suppliers would provide a service that is based on cold weather environments such as ski resorts. – Both the Bay Park Centre and the Jack Layton Ferry dock are “unrealized” projects which could incorporate gondola infrastructure. The gondola would provide an opportunity to move passenger load from Union Station to a Bay Park Centre gondola facility. – Costing estimates are readily available. The Canary Wharf gondola had a one kilometer span and cost 60 000 000 GB pounds in 2011. I hope this idea supports further discussion on a complex issue. Steve: I am posting this only in the interest of fairly presenting alternative viewpoints. That said, I am sick and tired of Gondola advocates popping up like bad pennies when there are situations like this with ill-considered schemes. 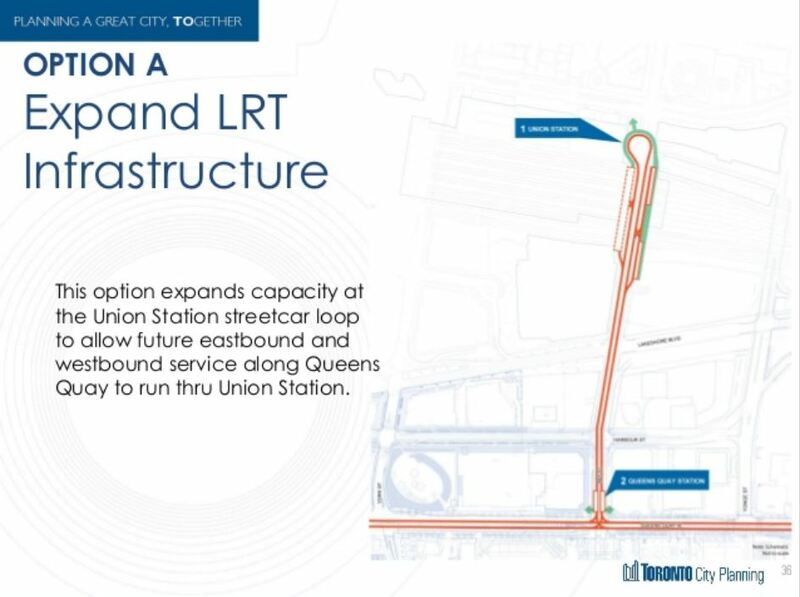 The most obvious problem which you completely fail to address is the need for vertical circulation between the existing transit infrastructure and the gondola station at Union, not to mention the height of the structure needed to clear both Union (rail) Station and the Gardiner Expressway. As for “views of the lake”, there are precious few of these along your proposed route. 10 Bay, by the way, is directly above the existing Queens Quay station and hardly a stopping point along the route. But what the hell — get yourself a lobbyist and a “friendly” Councillor or two, and who knows, Gondolas could be your ticket to the big time. I think that the suburban anti-transit politicians will be going for the cheapest alternative to the current streetcar tunnel, and definitely not expand the streetcar loop. Not for the sake of the transit user but for the almighty dollar and not to anger the automobile gods. This is similar to what is happening in Maryland. The Governor there didn’t want to spend $2.9 billion on a “wasteful boondoggle” of a a 14-mile light rail route, but is fine with spending $9 billion on widening 3 highways. Steve: I am hoping that John Tory can be convinced to support expansion of the streetcar loop as anything else will doom the link between the waterfront and Union. But he is far too open to snake oil salesmen when it comes to transit proposals, and I fear what we might see in the end. It has been very distressing to watch the degree to which killing off the Bay Street tunnel has been a working premise of the waterfront studies for some time on the grounds we “can’t afford it”. If they have to expand the Bay St. tunnel anyways, why not run a surface streetcar line north on York, through the moat at Union, then south on Bay? This will be largely right turns and not cut across the car traffic. I have a few other suggestions like gauntlet track to reduce the need for powered switches. Steve: The moat at Union is part of the circulation system of the rebuilt station. The absence of switches using gauntlet track presumes that all cars originating from one location are going to the same destination. Also, it complicates station platforms. I went to the O2 end of Emirates Airways for a “rail-fan ride”. I sat on a bench and thought about the experience ahead. As I sat there I noticed that no one much was getting on or off. In all fairness it was not rush hour- but here were lots of people on the tube during my journey to the O2. However, according The Guardian my experience was not inconsistent with reality all the time. The other thing I observed is that the cars go very high. (90m according to Wikipedia.) I sat on the bench for about 10 minutes and decided I didn’t need to be scared to death. I turned around and took the tube back to my hotel. Practical or otherwise (and I agree it is otherwise) I don’t want to travel hung from a cable high in the air. There’s a great opportunity now that both the City and the rail companies agree that we can build over live rail lines to solve the issues between east of Roncesvalles and Dufferin by just building over the railtracks with either new bridges or a flat surfaced area. I think what is best is to cross over to the west end of the Ex area at that ‘point” (thereby allowing potential transit to the Ex, but also GO bus access to a new transitway) and then cross back over to the north side of the tracks at the Dufferin area, then in to core on-surface. I know – why try for value in a 2 for 1 – but we really need something robust/viable/fast. And as for getting a great view for the transit rider, yes, and why not convert the Gardiner to have a transitway on it? We might have to do something first for transit, and that’s why i’m pushing a reversible transitway first, but there can be a great view on the Gardiner. And as for getting stops in the Gardiner, I’m sure we could modify the bents to support the cutting out of a segment to lower a transitway to an intermediate or ground level. Either support by hanging the weight on poles and cables, or adjustments on ground tho in the Lakeshore carridor. This is frustrating to have the climate change impacts too obvious and yet we’re struggling here in Moronto to learn lessons within a 1993 EA, and have planning legislation respected. 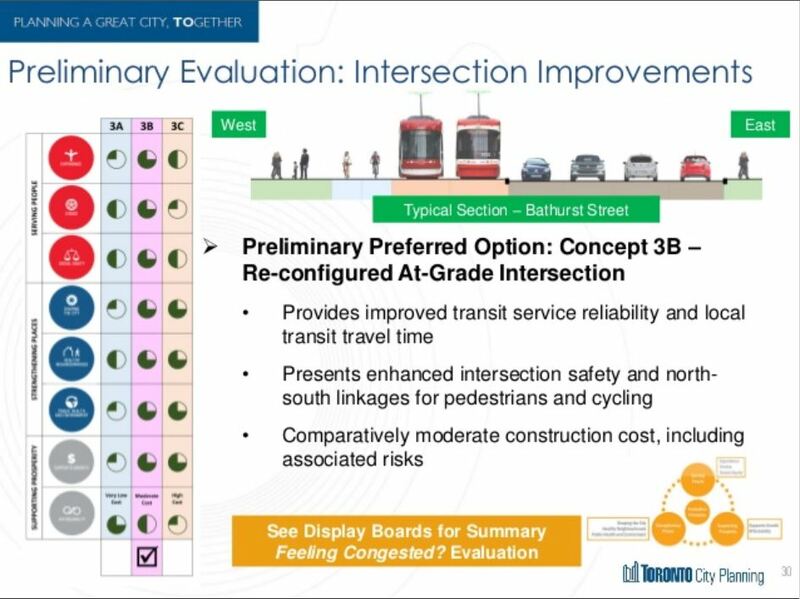 That means the Places to Grow 3.2.2 and 3.2.3 should be applicable to the Gardiner, but oh, I guess there are votes involved, and no penalties because no political will because votes are involved. A circular argument/vortext like draining water in a toilet and no surprise that the ice caps are melting right? And no, if consultants/planners are not told to actually plan for robust transit, I guess nothing will happen.Plan for a milk run atop mistakes, and get more of a muddle. With high costs. Thanks for your reply Steve. A couple of points: I wanted to comment on the KQR part initially, but my comment was already very long, so I will add it here. Regarding transit priority, the two situations are different. First – I think it is doubtful that transit priority would be granted to crossing streetcars, pedestrians and cyclists all day long and most importantly amidst rush hour LSBW traffic at Colborne Lodge Dr. I *do* however think it can be granted for 2-3 hours per day, to streetcars travelling in the same direction as traffic along LSBW west of Park Lawn. If you eliminate street parking *only* during peak hour (which for eastbound travel is before 90% of businesses even open on LSBW in South Etobicoke), you still have two vehicle lanes, and there is no throttling. Of course you also need to reduce turning movements and have long advance greens at the intersections, but even if that doesn’t work perfectly, it’s still less traffic for the streetcar to end up stuck behind. No contradiction there – I’m sure everyone can agree that transit priority measures will work or not work based on the specific contexts they are implemented in? And I mean come on, road paint and signage – doesn’t get much cheaper than that. If they can contemplate retunneling Union, excavating Bathurst, and installing funiculars and swan boat gondolas (ok maybe not the last one) downtown, surely the Waterfront Reset can budget what’s needed to try things out for a year or three before scrapping it, if necessary, based on solid evidence??? The time horizon for this planning exercise takes us out to 2041. We simply need more than signal priority which you yourself say does not work. If we gain reliability and speed east of Park Lawn, and lose it to the west, our transit situation has not improved. I don’t think the streetcar should or has to pass through the KQR intersection at all. If I did, I would not likely support putting it through there and would accept the Colborne Lodge route with its evils. I think the Eastbound Queensway vehicle lane and ROW should switch places, and have the streetcar cross over the eastbound Queensway lane to the west, at Glendale, a much more lightly trafficked intersection. That way, when it approaches Roncesvalles, the streetcar is already adjacent to the corridor and stays clear of the intersection itself. Then, you eliminate the eastbound Queensway > King St. W merge lane and have those vehicles turn right from the second Queensway > Queen St. W lane instead. This a) will dissuade cars attempting to shoot ahead of the streetcar into congestion, particularly when you have street parking right ahead (I’ve been on streetcars that have had to wait multiple signals for this very reason), and b) you can give right turning cars an advance green on existing signal stages (there is at the very least the northbound King St. W to Queensway westbound advance left turn signal which would pair well with it c) you free up quite a lot of physical space. This is a fairly modest concession to ask passenger vehicles to make at an important intersection for transit. As for the ROW, it would cross over the rail corridor immediately east of the existing pedestrian bridge at Roncesvalles (no ROW on King St. W or sharing of track with the 504!). You make the bridge structure wide enough to establish better, wider, separated bike lanes and pedestrian walkway, and you landscape it so it functions as an extension of the park. Yes, you are losing a small part of the park, but look at Colborne Lodge Dr. option – you lose a heck of a lot more parkland in that solution. By establishing a transit/cycle/pedestrian crossing there, you connect Parkdale to the lake much better than currently. Make the structure wide enough, and you can actually connect the King St. W park to the Lake shore in a much more meaningful way, a mini raildeck park. The pedestrian and cycle paths would land between the Boulevard Club and Palais Royale. The ROW route is the same as the Colborne Lodge route (2E) from that point forward. The route I describe above is not without challenges – proximity of Queensway to the corridor would be one, and I don’t know if there is the required 7m buffer, or if not, whether compensating measures can be taken (i.e. wall for physical separation – this is just the streetcar barn and St. Joe’s parking lot, so the view should not be an issue). Yes, it’s more expensive to build (though I would think cheaper in operating costs), but if you are improving cycling, pedestrian and community connections to the waterfront, then it fulfills broader mandates of Waterfront Toronto as well, and that should be factored in to the benefit-cost analysis. It is so important to not bybass St. Joes – the main west end hospital on this route, an employment centre and a destination that an enormous amount of money is spent transporting people to via Wheel Trans all year long. This also retains crucial transit connections to 501 and 504. It avoids needless track duplication. It provides better and more direct access to the streetcar barn. So far, the consultants have simply not looked at it with the detail it demands before it is dismissed. They need to look at it more seriously. If it can’t be done, it can’t be done. But it hasn’t even been evaluated with any effort that I can see. Apologies if this has already been suggested. I wouldn’t have suggested it save that any other suggestion so far will cost more, be highly disruptive, and render present infrastructure redundant. Has the present Union GO bus facility been considered as a loop for streetcars coming north on Bay, and returning south on Yonge? When the new GO bus terminal is opened (under construction) then the present facility will become vacant. It’s already perfectly positioned to terminate QQ east westbound traffic. The present tunnel loop would be retained for the western QQ legs, albeit track switching could be provided (if space permits) to also be a relief to the tunnel if it is blocked or temporarily unusable. Yes, this would be a ‘throwback’ to older times, but a relatively affordable and proven way of looping streetcars. Depending on how the track is aligned, it would also lend itself to servicing a Bay street streetcar line if deemed desirable. I choose the northern approach to the loop on Bay, and return south on Yonge to avoid the need for sharp loop, and so as to minimize fouling traffic when looping, whether the RoW will be shared or dedicated. Again, some of the other suggestions are so bizarre as to render the small technicalities of doing this as almost moot in comparison. Steve: Various alternatives for a loop (all underground) were examined in earlier parts of the study and rejected for a variety of technical factors. Surface operation is simply not viable given traffic congestion in the area, particularly when any special event snarls an already bad situation. This is a problem today for the buses which will, at least, be south of the rail corridor at the new terminal. To propose crappy pedestrian connections seems to be the latest trend in Ontario. Another recent example is in Hamilton, where we have the so-called “High-Order Pedestrian Connection”. This will “connect” the new LRT to the Hunter Street GO Station. does not work. Please try again. This would probably not have worked but is now clearly impossible as the existing GO Bus station area is part of the CIBC Square (ex Bay Park Centre) development. There will be an LRT ‘platform’ in their basement on the part of the development south of the rail berm. Thanks to Dave and Steve for enabling thoughtful comments and additional perspectives on what might and mightn’t work eg. the KQR and Queensway challenges. There is a difference between an occasional look-see and more focussed attention from presence and usages. So sure, let’s think about swapping car travel lanes for streetcar tracks if that will help get the connection up/back from Bloor and enable the quick trips in to the core east of Roncesvalles from King St., where I suspect that the congestion doesn’t really begin till east of Wilson Park. So having all sorts of new ‘land’ atop the rail lines from Wilson Park to near-Dufferin would be a boon to Parkdale and connections to the waterfront. I do urge getting to the south side at the western ‘point’ of the Ex for both the access to the Ex, but also to enable having GO buses get on a new transitway to the core to speed those services. Yes, it’s big expenditure. We’ve had a century of plans for robust east-west transit, and we don’t have an improvement yet, though thank Gaia for GO, and the existing workhorses. I think we need a new and direct corridor, and it should be on surface for a lot of reasons, and it’s best to catch Liberty Village too. As a hurry-it-up measure, how about having a reversible transitway like Jarvis? One lane only reduces the land required, and that would enable it to happen much better, though of course most other world cities would do it two-way, we’re just more world-last it seems right? Can you help clear up some confusion? For the central waterfront, Phase I of the Waterfront Transit Reset study specifically presented six concepts to be studied further (A1 – expanded Union Loop, A2 – new tunnel under Freeland St., B1 – 2nd LRT station at Spadina, C1 – maintaining the existing tunnel and service under Bay St., C2 – enhanced Bay St. bus service with a re-purposed tunnel, D1 – expanded network). But Phase II only presents an expansion and evaluation of a couple of these, A1 and C1, although the re-purposed tunnel from C2 is also included. Looking through the Phase II slide deck and the presentation panels I don’t see any explanation of the elimination of the other scenarios. Did Phase 2 review and eliminate them and just not share the outcome of those reviews? Did I miss a report that went into more detail? 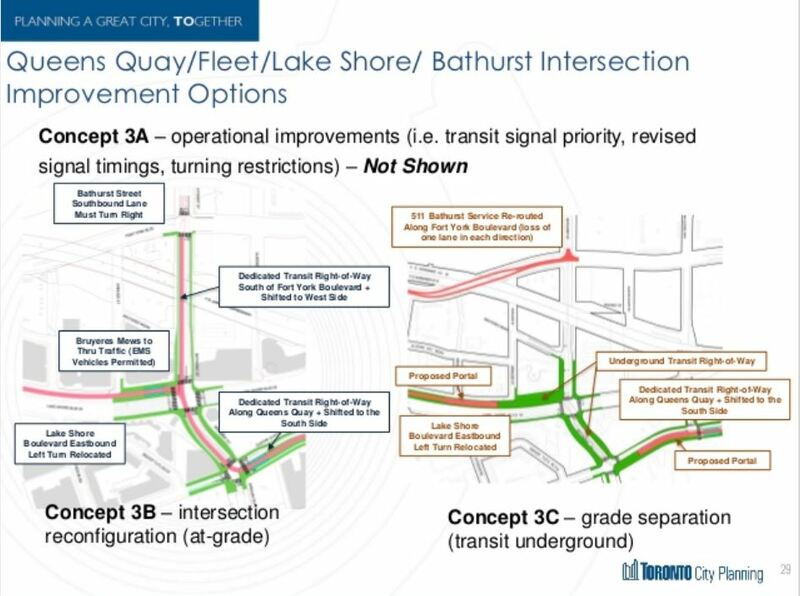 How did these six scenarios get reduced to “what do we do at Bathurst/Lakeshore?” and “three options to “expand or re-purpose the Bay St. tunnel”? Steve: Yes, some of the concepts that were carried over from Phase 1 were ruled out during the Phase 2 study. I sat on the advisory committee through this, but the discussions were not for publication as designs and choices would not be nailed down. Two specific options – the extended alignment east under the GO Bus station (A2) and the second station concept (B1) – were struck off the list quite early (March 2017), and D1 simply was not practical given competing traffic on the affected streets. The project team has clearly screwed up here by not including this filtering in the public presentation. Also, at the point we were looking at options, some of the designs for the Bay Street tunnel, either as streetcar or something else, had not progressed very much. The funicular did not appear until the very last advisory group meeting just before the whole thing went public. I hauled out by bike to the Etobicoke meeting; it’s a big City and there’s a lot more of it beyond where the meeting was held, and I got pretty tired from all of the biking, and it can be dodgy, tho it also has improved in some ways. It was useful to hear some of the context to the slides/options. However it also seems there’s near-zero interest in providing robust enough transit to enable us to toll the Gardiner and/or the Lakeshore, and we aren’t managing to really do enough for the two types of transit demand that the WWLRT EA saw about 24 years ago. There’s the commuter demands, which I think would like faster semi-express trips in, perhaps on new routes (hint hint), and those that want to get to the waterfront destinations, often more seasonal and off-peak. What we may be getting is building on the compromise that was made some decades back, and the phrase two wrongs don’t make a right comes to mind. And how overloaded is Union, and if it’s OK now, then how about in 10 years, and isn’t a system supposed to be resilient? Like most other reports, there is pressure to complete though it’s feeling inferior. And then it’ll be at a committee meeting, and nobody will want to adopt new ideas or criticize it and then more inferiority will be approved and perhaps built. We need a new corridor for faster/sub-regional transit, and we need to have a larger budget for dreaming, then planning, then doing of this robust transit. Existing politicians who’ve been around for a while, shouldn’t be allowed a free ride on the tiny bit of incrementalism that will be rolled out when there have been real plans for more robust transit for a century, and nada. We should demand that the Suspect Subway Extension NOT occur, and a billion be allocated to the fixes here, though of course Scarborough needs more transit, and deserves it. Based on the Phase I study, I would rank A1 (expanded Union Loop), A2 (eliminate Union Loop with through service just south of the Rail Corridor) and C1 (Queens Quay through service with reduced service to Union Loop) as the best options. It is interesting that in Phase II, they used to the term A2 – but it is for a partially expanded loop and not for through service on a street south of rail corridor. In Phase I, the “B” group of options are for a second loop, while in Phase II, it is for the moving sidewalk option. 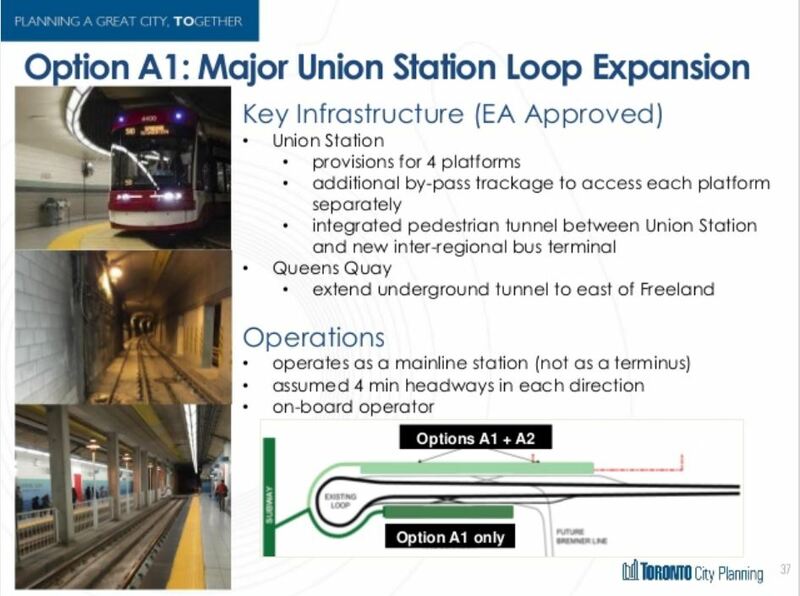 In Phase I, the “C” option is for some type of through service on Queens Quay, while in Phase II, it is for the funicular option. Are these mixed up in an attempt to deceive? Should they not have continuity of the reports and have consistent numbering. (i.e., in Phase II, the expanded Loop options should be called A1.1 and A1.2, the walkway as C2.1 and the Funicular as C2.2)? As stated by Gilbert, it is a glaring omission that they did not address all options that were carried forward. I don’t expect detailed designs, but they must be addressed (and I believe that Gilbert is mistaken that option C1 from Phase I was actually considered). This is another reason why people are so suspicious that proper planning was not considered. Steve: Yes, the inconsistencies in numbering do show a rather sloppy approach. I am going to try, again, to get a comment from the project team about this. You can add segment 2 to your list for numbering clarification Steve. In Phase 1, 2A referred to a Sunnyside crossing (without KQRQ intersection implications), and 2B referred to the north rail embankment (the only option with KQRQ implications). However, in Phase 2, 2B was renumbered/presented as 2A – even though 2B was clearly marked for elimination in Phase 1! (Check the presentations and display boards). So the KQRQ intersection was a moot point after Phase 1 – or should have been. Indeed, there seems to be very little consistency in the valuation of criteria in moving from Phase 1 to Phase 2. In moving from the first phase to the second, the evaluations simply do not provide the necessary justification for eliminating 2A, particularly since 2E bypasses a vital health centre and employment connection at St Joe’s Hospital – a hospital that serves 500,000 west-end residents of Toronto. In light of the above, at the very least, the recommendation to Executive Committee should be that both 2E and 2A proceed for further consideration, so that 2A can receive the same preliminary functional plan that 2E received. I’m a little concerned that the Leslie to Woodbine LRT portion seems to be viewed from the perspective of on route demand rather than also the bridge traffic demand as an “LRT relief line” for the east end streetcars until the first phase of the DRL is complete. Assuming it takes Coxwell to reach Queen, the fact that there would only be two stops (Queen/Eastern-Coxwell) & Coxwell-Lakeshore) before Leslie would mean higher speeds which would offset the longer route. Steve: There simply isn’t enough traffic coming out of the east end to justify a separate route between Leslie and Woodbine, even allowing for some build-up of service when the TTC has more cars. There is little delay on Queen between Coxwell and Leslie from road traffic. The Agenda for the 24 October Executive Committee is posted – no sign of “Waterfront Transit” on it. Maybe they are having second thoughts about their bizarre proposals? Steve: I will check with City staff later today, but suspect it has been pushed to November. Updated: It is confirmed that the Waterfront Transit report will not be on the Exec agenda until November, which is also when the next SmartTrack report will appear. No sign of the promised (and already a month late) Report to Executive Committee on their November 28 agenda. Steve: It’s a really heavy agenda as things stand. Last time I heard anyone talk about this, they were “refining” the figures. 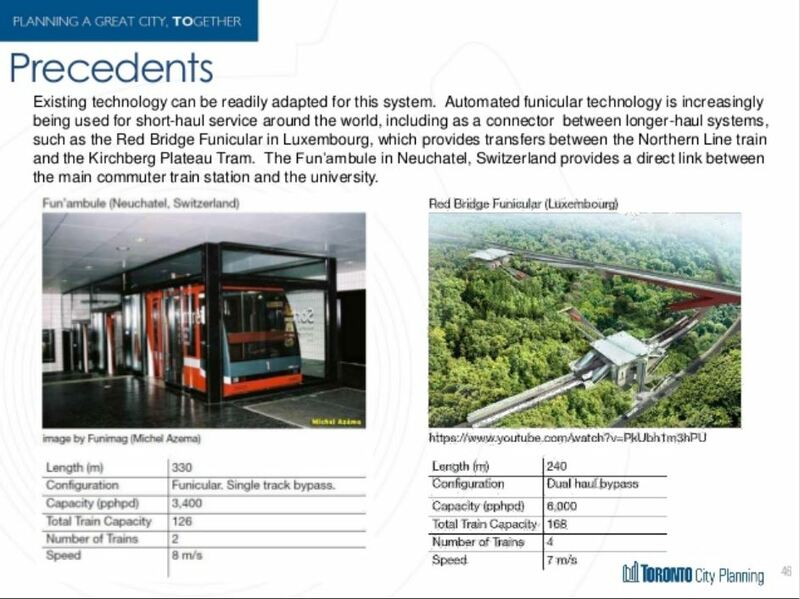 The TTC wants to keep the streetcars, but Will Fleissig seems to still be pushing the funicular. I’m not sure if he has one in his garage he’s looking to unload.